"More than 200 names were turned over to Commonwealth Attorney Raymond Morrogh for investigation. The names appeared on voter rolls, even though the individuals had excused themselves from jury duty because they were not citizens. "But the cases have fallen through bureaucratic cracks in Virginia’s most populous county — and most of the identified aliens remain on the voting rolls. "Fairfax Clerk of Court John Frey said he produced the list of names at the request of the Electoral Board. But neither Frey nor the board has prosecutorial powers in the matter. "According to board records, 278 registered voters did not affirm citizenship, as required, between 2010 and the end of 2011. "Of these, 117 had a history of voting within Virginia. "The Electoral Board referred its findings to Morrogh on four occasions: June 25, 2010; Feb. 28, 2011; May 3, 2011; and Aug. 18, 2011. "Names of an additional 36 non-affirming voters were relayed to the commonwealth attorney March 2, 2012." "Election-integrity organizations call the “no-fraud” assertion both misleading and self-fulfilling when prosecutors will not prosecute. "Morrogh, a Democrat, did not respond to Watchdog’s inquiries. "Catherine Engelbrecht, president of the Texas-based group, True the Vote, said the Obama administration has chilled the atmosphere for warranted prosecutions. “The kind of selective justice being meted out by the Fairfax County prosecutor, though clearly a violation of voters’ rights, is part of the ‘new normal’ standard supported nationwide by Eric Holder’s Department of Justice,” Engelbrecht told Watchdog. Please note that I've excerpted perhaps only half of Kenric Ward's outstanding reporting on the potential voting fraud cases in neighboring Fairfax County. His complete report is here. Could the same circumstances occur in Virginia's Arlington County? We assume it could, but don't know. Nor whether there have been any cases, similar to those in Fairfax County, reported to the Commonwealth's Attorney. We know, we know, Arlington County is "squeaky clean," as a former County Board member was heard to say, but perhaps an intrepid Arlington journalist can provide the answer. If we get an answer from the Office of Voter Registration or from the Clerk of the Circuit Court, ElGrowlerGrande will update this Growls with their answers. "Dozens of employees working for an obscure federal agency went years with little work to do, allowing them to collect salaries and bonuses while they shopped online, caught up on chores, watched television or walked the dog, an investigation revealed Tuesday. "The probe by the Commerce Department’s inspector general found that paralegals at the U.S. Patent and Trademark Office’s appeals board were paid more than $5 million for their time even though there was so little work for them to do that supervisors didn’t care how they used it. “I almost don’t blame [paralegals] for watching TV because, I mean, you’re sitting around for 800 hours,” one chief judge told the investigators, who found that supervisors not only tolerated the problem but in one instance admonished an employee who complained about the lack of work. "The idle paralegals nonetheless managed to take home more than a half-million dollars in performance bonuses from 2009 to 2013, before the agency hired enough judges to increase the workload, according to the report. "Investigators said the practice continued until last year when agency officials got word that the inspector general's office was looking into complaints from whistleblowers. Thank goodness for the whistleblower! Otherwise, one presumes the non-working fedrull work would still continue. "Still, the paralegals received such high performance ratings that supervisors doled out generous bonuses. None of that waste, fraud and abuse could occur in the offices of Arlington County government since, like the U.S. Commerce Department, the county government has an active, fully staffed Office of Inspector General or, alternatively, an internal audit function. Oops, oh no, On further thought, Arlington County only has plans to add one or two internal auditors. And at least three members of the Board are dragging their feet to do even that. Wonder why the federal government can't get the big things right, e.g., ObamaCare, IRS, Veterans Administration, etc. Heck, they they can't even get the little things like managing a small Patent and Trademark Office appeals board right. Sheesh! "The underworked paralegals did little as a backlog of appeals of patent examinations that many of them were hired to help process doubled from about 12,500 in fiscal 2009 to 25,300 last year. Soon after the appeals board brought on additional legal support staff to address a deluge of challenges to decisions by patent examiners, the Patent and Trademark Office imposed a hiring freeze that halted hires of judges needed to handle the appeals. "But they took home more than $4.3 million in pay and about $700,000 in annual performance bonuses of up to $3,500 apiece for “outstanding” work from 2009 through 2013, the report released Tuesday found. "The employees also worked from home . . . ."
Sounds better than being a retired fedrull employee. Double sheesh! What? You Mean the Unemployment Rate isn't 6.1%? "The July jobs figures, due out Friday at 8:30 a.m. EST, are expected to show continued momentum in U.S. labor markets. Economists are predicting 230,000 new jobs were added last month and that the unemployment rate will hold steady at 6.1%, its lowest level in nearly six years. "For most of 2014 labor markets have been a consistent source of strength in the ongoing economic recovery. Monthly average gains this year are well over 200,000 and the headline unemployment rate continues to fall. The economy added 288,000 jobs in May." We growled about the June jobs on July 3, 2014. However, Peter Morici, economics and business professor at the University of Maryland raises serious questions about the accuracy of an unemployment rate of 6.1%, writing in his column for Breitbart's Big Government today, "The jobless rate may be down from its recession peak of 10 percent, but much of this results from adults, discouraged by the lack of decent job openings, having quit altogether. They are neither employed nor looking for work." "Only about half of the drop in the adult participation rate may be attributed to the Baby Boom generation reaching retirement age. Lacking adequate resources to retire, a larger percentage of adults over 65 are working than before the recession. "Many Americans who would like full time jobs are stuck in part-time positions, because businesses can hire desirable part-time workers to supplement a core of permanent, full-time employees, but at lower wages. And Obamacare’s employer health insurance mandates will not apply to workers on the job less than 30 hours a week." "Since 2000, Congress has enhanced the earned income tax credit and expanded programs that provide direct benefits to low-income workers, including food stamps, Medicaid, Obamacare, and rent and mortgage assistance. "Virtually all phase (out) as family incomes rise, either by securing higher hourly pay or working more hours, and impose an effective marginal tax rate as high as 50 percent. Consequently, these programs discourage work and skills acquisition and encourage single parents and one partner in two adult households not to work. Often, these motivate single people to work only part-time. "New business regulations, more burdensome than are necessary to accomplish legitimate consumer protection and environmental objectives, exacerbate these problems. "All of this suppresses wages except for the most skilled and talented workers. "No surprise, average family income, adjusted for inflation has fallen from about $55,600 in 2007 to $51,000 even as the gap between families at the bottom and top widens." Take a few minutes to read Peter Morici's entire column, and brush up on your college economics class at the same time. What Is Arlington County Board Hiding? In his weekly column at ARLnow.com last week, Peter Rousselot, who leads the anti-Columbia Pike streetcar group, Arlingtonians for Sensible Transit, uses the column to ask which Capital Improvement Plan (CIP) projects the Arlington County Board is hiding in favor of the Columbia Pike streetcar. "Prior to approving its latest Capital Improvement Plan (CIP), a bare majority of the Arlington County Board (Fisette, Hynes, Tejada) voted to deny the public access to critical information. The information they suppressed relates to new transportation projects that are being denied funding or delayed as streetcar costs continue escalating sharply. "The vote to suppress this information comes at a time that this same majority has sanctioned a $650,000 public relations campaign at taxpayer expense to promote the streetcar. "Both actions represent desperate attempts to refloat a sinking ship. "The CIP approved by the Board on July 19 documents sharp increases in streetcar costs as a percentage of Arlington’s total capital budget. "Two years ago, in the FY 2013-2022 CIP, the Columbia Pike streetcar was projected to consume 8 percent of the total CIP and the Crystal City Streetcar 6 percent, for a CIP total of 14 percent devoted to the two streetcars combined. Today, both projects have jumped in cost, and total 19 percent of the FY 2015-2024 CIP for the two streetcars. "In other words, just two streetcar lines totaling only 7.4 miles, consume 19 percent of our total Arlington capital budget, or nearly one out of five of our proposed capital spending dollars over the next 10 years." Rousselot continues his column with a series of related questions, and concludes by asking why the three members of the County Board who support the Columbia Pike streetcar are afraid of providing fellow Board members Libby Garvey and John Vihstadt, not to mention the taxpayers of Arlington County, with a list of alternative projects that could be funded with 19% of the total CIP that is now planned to be spent on the Columbia Pike streetcar. If they ask, tell them ACTA sent you! "There will always be occasions for discretion and interpretation on legal questions, but it is not the case that such discretion should presumptively empower the IRS to do things that the IRS is not legally entitled to do simply because Barack Obama wishes it to be so. If history teaches us anything, it is that a system of law that presumptively sides with political power soon ceases to be any sort of system of law at all. Rather, it becomes a post facto justification for the will to power, an intellectual window dressing on might-makes-right rule. "The matter addressed in Halbig is hardly the Obama administration’s first attempt to circumvent the law as written — see Hobby Lobby, etc. — nor is it the progressives’ only attempt to impose what they imagine to be enlightened ad-hocracy on the American people. The disdain for the letter of the law is complexly intertwined with the progressive managerial imagination: The law, in their view, is not something that limits the ambitions of princes, but something that empowers them to do what they see fit. It is not surprising that conservative concerns about limited government frustrate and befuddle those who see the law in that way. They imagine government to be something like a plasma cutting table, a complex and precise tool that, in the right hands, can reshape the world in desirable, predictable ways. But government is not a complicated tool. It is in fact a simple tool: a bayonet." Source: His 7/27/14 column, posted at National Review Online. HT Hot Air. "President Barack Obama turned his focus Wednesday to the pocketbook issues that Americans consistently rank as a top concern, arguing that the dream of upward economic mobility is breaking down and the growing income gap is a "defining challenge of our time." "The president vowed to focus the last three years of his presidency on addressing the discrepancy and a rapidly growing deficit of opportunity that he said is a bigger threat than the fiscal deficit. "Obama's remarks on the economy come as he seeks to move past the health care woes that have consumed his presidency in recent months. He acknowledged his administration's "poor execution" in rolling out the flawed website that was supposed to be an easy portal for purchasing insurance, while blaming Republicans for a "reckless" shutdown of the government." Kuhnenn also noted, "Obama did not propose any new policy initiatives in the speech, sponsored by the Center for American Progress, a think tank with close ties to the White House. But he reiterated his call for an increase in the minimum wage and other measures he's been backing to help lower income Americans." "Economic inequality in the United States has been receiving a lot of attention. But it’s not merely an issue of the rich getting richer. The typical American household has been getting poorer, too. "The inflation-adjusted net worth for the typical household was $87,992 in 2003. Ten years later, it was only $56,335, or a 36 percent decline, according to a study financed by the Russell Sage Foundation. Those are the figures for a household at the median point in the wealth distribution — the level at which there are an equal number of households whose worth is higher and lower. But during the same period, the net worth of wealthy households increased substantially. "The Russell Sage study also examined net worth at the 95th percentile. (For households at that level, 94 percent of the population had less wealth and 4 percent had more.) It found that for this well-do-do slice of the population, household net worth increased 14 percent over the same 10 years. Other research, by economists like Edward Wolff at New York University, has shown even greater gains in wealth for the richest 1 percent of households. "For households at the median level of net worth, much of the damage has occurred since the start of the last recession in 2007. Until then, net worth had been rising for the typical household, although at a slower pace than for households in higher wealth brackets. But much of the gain for many typical households came from the rising value of their homes. Exclude that housing wealth and the picture is worse: Median net worth began to decline even earlier. "The reasons for these declines are complex and controversial, but one point seems clear: When only a few people are winning and more than half the population is losing, surely something is amiss. Ms. Bernasek concludes by pointing out: "The reasons for these declines are complex and controversial." Well, if the reasons for the decline in household worth "are complex and controversial," then how is it going to be reversed with simple fixes such as reducing economic inequality and raising the minimum wage? Taxpayers would like to know. "Now if you were a low information voter, you might conclude from that excerpt that it is the rotten rich who are responsible for this decline. To do that you have to believe that the economy is a finite pie and when someone takes a big slice, everyone else gets smaller slices. But that’s not the case is it. This really doesn’t have anything to do with income inequality, as the left would have you believe. "Think about it – average income is a total divided by a number. That means that the total income of everyone working is divided by the number of families out there. "So if that’s the case, what’s the key? The number of people working. No work, no income. The families still exist in the same numbers, but the income that has been supporting them is down due to what? Unemployment. "And, of course, because it is bad news for Democrats, we don’t hear much about that anymore. A simple graph, however, will help pinpoint the problem." McQuain refers readers to a chart, which he includes. "The report also found that wealth has become more concentrated in the past decade. In 2003, households at the 95th percentile of wealth held 14 times as much as the median household. In 2013, it had 24 times the wealth. "The Russell Sage Foundation study includes data from 2013, a feature other measures of wealth do not have. But the finding that the median household lost roughly a third of its wealth over the decade matches up with data from other sources. For instance, New York University economist Edward Wolff, using data from the Federal Reserve's triennial Survey of Consumer Finances, found that median household wealth fell by a similar amount after the crisis, from about $90,000 in 2001 to $60,000 in 2010. Results from the 2013 Survey of Consumer Finances will be released early next year." Austerity? Do Members of Congress Know the Meaning? "Old habits die hard. During the first session of the 113th Congress, members of the U.S. House authored 496 spending bills, compared with 112 bills that would save money. U.S. senators, meanwhile, drafted 332 increase bills and 56 savings bills — all this according to “Bill Tally,” an analysis released Wednesday by the National Taxpayers Union Foundation. "But wait. Had all 828 of those big-spender wish lists been passed, it would have increased the federal budget by $1.09 trillion. So we need to be careful not to tell our lavish lawmakers what comes after a trillion, so they don’t get any ideas. That goes for the White House, too. Amazingly enough, the study also reports that the number of proposed spending bills is actually the lowest in eight years. "There are some frugal folk on Capitol Hill, however, both Republicans. Rep. Trent Franks of Arizona proposed spending cuts that would have resulted in $269 billion in savings. Sen. Rand Paul of Kentucky wins the prize: He offered legislation that would reduce the federal budget the most, the study found — by $317 billion. "Congress’ agenda still exceeds $1 trillion, as it did during 2011-2012. For concerned taxpayers and fiscal hawks that bottom line may stand out as a sign that legislators are still offering major government-expanding agendas, even with a noted cooling of activity and despite the grim long-term forecast for the federal budget,” says Demian Brady, who led the research." "Many pundits and commentators have been quick – perhaps even eager – to proclaim that the Tea Party is dead. For their part, voters have not always been inclined to agree. Candidates aligned with or reflecting many principles of this limited government movement have pulled out some stunning upsets during this election season. Chief among them is the historic, unprecedented primary-level defeat of a Majority Leader of the House of Representatives. And while the Tea Party’s impact on reducing Congressional spending agendas is still evident, results from the current Congress show that its effect may be cooling. "Because the Tea Party is largely a localized, grassroots phenomenon supporting an overarching agenda, its participants can sway legislation and the formation of policy, not just the fortunes of candidates. Whatever influence the Tea Party may be exerting on the electoral process, is there a way to analyze its impact on the budget process? Thanks to National Taxpayers Union Foundation’s (NTUF) BillTally system, the answer is emphatically “yes”. "The Tea Party freshman class of the previous 112th Congress helped bring the cost of Senators’ and Representatives’ agendas down significantly. During the current 113th Congress, there are still a significant number of lawmakers calling for cuts, but not as many as during the previous Congress and the dollar amount of the proposed cuts is smaller. The data from the last Congress showed a widening chasm between those who would grow the government and those proposing to shrink it. That gap is narrowing this Congress as the average Republican is calling for more modest budgetary pullbacks and the average Democrat, on the other hand, is calling for less budgetary expansion." Finally, NTU provides historical and other data for taxpayers, elected officials, the media, and advocates. Click here for link to the press release and various pieces of information and members database associated with their "Tea is Cooling" BillTally report. Kudos to Demian Brady and the National Taxpayers Union for their latest BillTally accounting. For the record, we growled about the headquarters building of the Consumer Finance Protection Bureau (CFPR) on July 7, 2014, suggesting it was a case of "bureaucrats gone wild." Citizens Against Government Waste (CAGW) announced today that they have "named Consumer Financial Protection Bureau (CFPB) Director Richard Cordray its July Porker of the Month because of his gross mismanagement of the CFPB’s headquarters renovation budget, which has ballooned by almost 300 percent from a projected initial cost of $55 million to $215.8 million, and for the agency’s inability to produce a single shred of documentation related to the renovation." More information about Citizens Against Government Waste (CAGW) is available here. Will 'Streetcar Battle' Produce Better County Board Policy? "Arlington County Board members need to formally approve government grants as low as several thousand dollars, but did not get a chance to vet a management contract worth perhaps $7 million for services related to the Columbia Pike streetcar. "How come? County staff have an explanation, but not everyone on the County Board is buying it. And as a result, there might eventually be a policy change to give elected officials more oversight." "Garvey and Vihstadt were critical of the staff’s bypassing elected officials, and demanded to know why. "In a response both to Vihstadt and the Sun Gazette, county officials pointed to intricacies contained within the Arlington County Purchasing Resolution. "Seems pretty cut-and-dried, until county staff take into account another portion of the resolution, which defines professional services as being accounting, architecture, land surveying, landscape architecture, law, dentistry, medicine, optometry, pharmacy, actuarial services or professional engineering." "Vihstadt used a recent work session on the county government’s capital-improvement plan to introduce a resolution calling for County Board oversight over every capital-improvement contract valued at $1 million or more. In order to get majority support, he agreed – “reluctantly” – to refine the proposal and give County Manager Barbara Donnellan until November to come back and address the potential impacts of such a change. "Vihstadt said he hopes his board colleagues will see his point of view. The day following April's special election, we growled whether the election of John Vihstadt by the voters of Arlington County would see a "new era of fiscal sanity." To date, it seems our question has been answered. First on internal auditing, and now on greater contract oversight by the Arlington County Board. HT "25 Great Quotes from Black Conservatives," by John Hawkins, January 29, 2014, posted at Townhall.com. Sue and Settle: Green Harrasment? "If you've never heard of the litigation technique "sue and settle," it's the hottest new strategy for extreme environmentalists to make millions of acres of prime land for ranching, farming, oil and gas drilling, and mining of natural resources off limits for development. "Sue and settle involves a stealth partnership between anti-development Obama administration regulators at the Environmental Protection Agency or the Interior Department and litigious green groups — including Greenpeace, Defenders of Wildlife, WildEarth Guardians and the Sierra Club — who want to halt fossil fuel development and other projects on federal and even private lands. "The racket is working all too well. Green groups sue the administration to act — to add a species to the endangered list, for example. The Obama administration bypasses normal science reviews and open hearings and caves in to the demands of the green agitators." Moore also reports that "(s)tates are fighting back:"
" . . . Last week, Oklahoma's Scott Pruitt and 11 other state attorneys general sued EPA over its secretive process that Pruitt calls "regulation through litigation." "Pruitt tells me that "sue and settle has become one of the major impediments to economic growth and development in Oklahoma. The process is rigged against us and disregards our own actions to protect the environment without paralyzing development." "To be precise, H.R. 2279 would allow Congress to mitigate the ills caused by an overabundance of deadlines in environmental laws enacted during the 1970s. At the time, statutory deadlines, by which time federal agencies must execute their duties, were perceived as an innovation in Congressional oversight. In practice, however, they’ve wreaked havoc on the regulatory process." Part 1 of House report 113-179 (available at the bill status and summary after searching for H.R. 2279 at the Library of Congress' Thomas) contains 21 pages of background in legislative language. The House passed the bill 225-188, which included a No vote by Arlington County's representative, Jim Moran (D). In the Senate, it has been referred to the Senate Committee on the Environment and Public Works. "The REDO act is a welcome start. Other environmental statutes are in dire need of a similar correction course." "Typically, the federal government defends itself vigorously against lawsuits challenging its actions. But not always: Sometimes regulators are only too happy to face collusive lawsuits by friendly “foes” that are aimed at compelling government action that would otherwise be difficult or impossible to achieve. Rather than defend these cases, regulators settle them in a phenomenon known as “sue and settle.” This tactic has exploded under the Obama Administration, costing the economy tens of billions of dollars while eroding political accountability and public participation in government. There are solutions: The executive branch should return to the principles adopted during the Reagan Administration by Attorney General Edwin Meese III, and Congress should require transparency and accountability in settlements that commit agencies to action." "If sue and settle is not reined in, says Hamm, it could cost "tens of billions of dollars in lost output. This is a big deal to states like Oklahoma and our ability to use our state resources efficiently and in an environmentally sound way." "President Obama always says 'follow the science,'" he adds. "But this isn't rule-making based on sound science. It's a way for environmentalists to get around sound science." Another extended discussion can be found in a 54-page report, "Sue and Settle: Regulating Behind closed Doors" (May 2013). The Center for Regulatory Solutions also published a report, saying that sue and settle amounts to "regulation without representation." The Center reports the Sierra Club is the most frequent plaintiff among environmental groups. "On top of all that, we taxpayers, including those impacted regulatory victims, are put on the hook for legal fees of both colluding parties. According to a 2011 GAO report, this amounted to millions of dollars awarded to environmental organizations for EPA litigations between 1995 and 2010. Three “Big Green” groups received 41% of this payback: Earthjustice, $4,655,425 (30%); the Sierra Club, $966,687; and the Natural Resources Defense Council, $252,004. Most of this was paid to environmental attorneys in connection to lawsuits filed under the Clean Air Act, followed next by the Clean Water Act. "In addition, the Department of Justice forked over at least $43 million of our money defending EPA in court between 1998 and 2010. This didn’t include money spent by EPA for their legal costs in connection with those rip-offs, since EPA doesn’t keep track of their attorney’s time on a case-by-case basis." "There has been a lot of misinformation about the Agency’s approach to lawsuits against it. Notably, these criticisms tend to be directed solely to citizen suits filed principally by individuals and organizations who purport to seek only to hold the Agency accountable. Escaping the criticism are challenges brought by industry and others, who typically account for half or more of the lawsuits filed against EPA annually. "To be clear, courts ultimately determine the legitimacy of suits brought under the laws allowing for such challenges. And it is not the motivation of the underlying challenge that shapes the Agency’s response to it, but rather it is how we, working with the Department of Justice, evaluate the claims based on the law. Our focus is not on who is the plaintiff, but on any allegation that EPA has not complied with its statutory duties, and how to best ensure that we are able to move forward, adhering to the law and the science. "The “sue and settle” rhetoric, strategically mislabeled by its proponents, is an often-repeated but a wholly invented accusation that gets no more true with frequent retelling. So it is time to set the record straight." Arlington County residents will be asked to vote on four bond referenda on Tuesday, November 4, as the Arlington County Board voted at their regular meeting yesterday (agenda item 43.C., plus two supplemental reports) to ask the Circuit Court "to place the referenda on the ballot," according to an online news report today by Scott McCaffrey of the Arlington Sun Gazette. • $105.78 million for education, funding the entire package requested by the School Board. • $60.24 million for Metro and transportation. • $39.9 million for community infrastructure, including the Neighborhood Conservation program. • $13 million for local parks and recreation, including $2 million for land acquisition. McCaffrey describes several changes made to the four bond packages in the original report to the Board, dated July 11, 2014 (see the Board's Saturday agenda here). He also writes, "The bond referendums are the most tangible result of Saturday’s adoption by the County Board of a 10-year, $2.7 billion capital-improvement program, or CIP," which is in the report to the Board numbered 43.A. Report to the Board numbered 43.B. contains the revised financial and debt management policies. We will provide further analyses of the bond referenda at a later date. For some of the "give and take" from yesterday's Arlington County Board meeting, see Patricia Sullivan's report that appeared in today's Washington Post. We linked to it in an "update" to our July 18, 2014 Growls. "Leftists might argue that the free market doesn't help the poor. That argument can't even pass the smell test. Imagine that you are an unborn spirit and God condemned you to a life of poverty but gave you a choice of the country in which to be poor. Which country would you choose? To help with your choice, here are facts provided by Robert Rector and Rachel Sheffield in their report "Understanding Poverty in the United States: Surprising Facts About America's Poor." Eighty percent of American poor households have air conditioning. Nearly three-fourths have a car or truck, and 31 percent have two or more. Almost two-thirds have cable or satellite TV. Half have one or more computers. Forty-two percent own their homes. The average poor American has more living space than the typical non-poor person in Sweden, France and the U.K. Ninety-six percent of poor parents stated that their children were never hungry because they could not afford food. The bottom line is that there is little or no material poverty in the U.S."
Source: His July 2, 2014 Column, "Economic Freedom," posted at Townhall.com. Yesterday afternoon, the Arlington County Board held s final work session on the FY 2015 - FY 2024 Capital Improvement Plan (CIP), originally scheduled for one and on-half hours, but one that extended to three hours. "The Arlington County Board, once known for its 5-0 votes and near-unanamity of opinion on how to build the perfect progressive suburb, can no longer agree on whether the promise of an extra $65 million from the commonwealth is a good thing. "In a contentious three-hour session Thursday, the board members traded verbal barbs over the Columbia Pike streetcar project, and whether last week’s announcement that the state of Virginia is willing to pay for half the cost of the line can really be trusted. "She and John Vihstadt (I), who also opposes the streetcar, tried to use a normally routine workshop meeting on the county’s capital improvements projects to stop the long-planned transit project in south Arlington. They proposed a series of motions to stop all spending on the streetcar plans, but they lost almost all on 3-2 votes." Of the others, Sullivan wrote, "the board agreed to ask the county manager to study whether capital projects of more than $1 million should be subject to the board’s approval. The board also unanimously voted not to use residential taxpayer money on the streetcar, a policy they’ve expressed before." "County Manager Barbara Donnellan tried to swat down the question of how reliable the state transportation money is, calling it “the most sure transportation funding [I’ve seen], as someone who’s been here 30 years.” She noted that Metrorail was built without funding guarantees. Accurate, too, as my notes from the meeting also show! Scott McCaffrey covered the work session in several separate articles, including a post in his Editor's Notebook blog, where he explained his early exit from the work session. "The Arlington business community will be on the hook for $10 million more than previously announced under the new funding plan for the Columbia Pike streeetcar, unveiled by County Manager Barbara Donnellan at a July 17 work session. "Funding from a 12.5-percent surcharge on taxes levied on commercial property would account for $69.8 million of Arlington’s share of the cost of the controversial streetcar project, or 26 percent of the local cost, under the new plan. That compares to a previous estimate of $59.8 million, or 21 percent of the project cost, in a scenario that included the prospect of federal funding. "In a he-probably-regretted-it-the-moment-it-came-out-of-his-mouth moment, county transportation chief Dennis Leach referred to the $10 million change as simply a “slight increase.” Taking more funds from the commercial-surcharge pot of gold gives opponents of the streetcar project another line of attack against supporters, who say the funds could be better spent elsewhere. "But allocating $69.8 million of those funds, rather than $59.8 million, to the streetcar project means there will be $10 million that won’t go to other projects." "At first blush, the 12.5-percent surcharge on commercial property, which was authorized and then mandated by the General Assembly, appears to fly in the face of the state constitution, which requires that commercial and residential property be assessed at similar rates. "But when the issue went to the Virginia Supreme Court, the justices ruled that as long as the funding generated was dedicated to a specific purpose and within a specific location, in this case transportation and Northern Virginia, then the surcharge was allowable. "Both state and local business organizations generally have been supportive of the surcharge, so long as the funding goes toward a range of transportation improvements that includes both roads and transit." In a second article, McCaffey reports that "Arlington officials have newfound praise for VDOT.," pointing out that its "a situation that a few years ago would have seemed as unlikely as cats and mice signing a truce to live in peace and harmony." McCaffrey had two more articles, which reported on separate items that are unrelated to transportation issues. First, he reported the County Board "tiptoed away from fast-tracking the move of Fire Station No. 8 and the Office of Emergency Management to new homes at 26th Street North and Old Dominion Drive." In the fourth article that resulted from the County Board's CIP work session yesterday, McCaffrey reported that "Arlington officials have agreed to spend $300,000 more over the coming year to bring additional bus stops into compliance with the federal Americans with Disabilities Act." "Board members Libby Garvey and John Vihstadt, the County Board’s two streetcar opponents, grilled county Transportation Director Dennis Leach and other county staff about the reliability of state funds and the county’s projections. Virginia Secretary of Transportation Aubrey Layne announced last week that the state would contribute up to $65 million to the project. Although I could not find coverage of the County Board's CIP work session by the Arlington Patch, they did provide earlier coverage of the state providing up to $65 million for the Columbia Pike streetcar. They also reported that county poobahs will "beat the drum for controversial streetcar plan." If they ask, them ACTA sent you! "If we don’t do this, . . . we become a bottleneck for the region and we become a far less wonderful place to live,” warned Hynes. In our Growls yesterday, we talked about the direction the United States was moving in regards to economic freedom because "the United State’s economic freedom score has declined every year since 2008." Now comes Michael Boskin, economics professor at Stanford University and chairman of President George H.W. Bush's Council of Economic Advisors, who in an op-ed today in the Wall Street Journal (but unfortunately behind the WSJ's dreaded paywall) discusses "how Washington whittles away property rights." "Property rights and the rule of law are essential foundations for a vibrant economy. When they are threatened, or uncertain, the result is inefficiency, rent-seeking, a larger underground economy and capital flight. "Unfortunately, individual rights to capital, land and the fruits of one's labor are threatened—in many cases redistributed from creditors to debtors, from those out of political power to those in power, and especially from young to old. And a much larger battle is looming." He then provides several examples of historical losses of property rights. For example, Boskin cites the 2005 Kelo v. City of New London Supreme Court decision, the 2009 trampling of "the legal rights of secured Chrysler bondholders," and the EPA's issuance of "1,500 wetlands compliance orders annually to halt land use." "The biggest future threat will be to the fruits of one's labor. The unfunded liabilities of Social Security and Medicare are now several times the national debt; the unfunded liabilities of state and local governments for pensions and other benefits are in the trillions of dollars and mounting. The panoply of other government programs nonetheless continues to expand. The result, according to Congressional Budget Office projections, is that federal spending will reach 36% of GDP in a generation. This implies that taxes will have to double from the current, near-historic average, 18% of GDP. All federal taxes will increase—on income, capital gains, dividends, corporate earnings, employer and employee payrolls. "Left unchecked, many middle-income earners eventually will face marginal tax rates of 70% or higher—reducing them to minority partners in their own additional work and sundering the value of the investments in their own education. "Either the next generation will be saddled with steeply higher taxes on their work and savings, or the growth in entitlement spending will be slowed. The political battles over this fundamental question will be waged between generations, income groups, high- and low-tax states, taxpayers and retirees, public employees and recipients of every other government service." "The math is unavoidable. The biggest safety-net programs, including Social Security and Medicare, began under far different economic and demographic conditions. But as economic growth has slowed and the population has aged, the ratio of people receiving government benefits to those paying taxes has been rising rapidly. Spending on these two and other entitlement programs will gobble up bigger and bigger chunks of the federal budget. They are already crowding out defense. "Ultimately, behind this and other attacks on property rights is the notion that the government owns all income, leaving to you only what it doesn't demand. But as President Reagan said in July 1987, "working people need to know their jobs, take-home pay, homes, and pensions are not vulnerable to the threat of a grandiose, inefficient, and overbearing government." In particular, taxation "beyond a certain level becomes servitude. And in America, it is the Government that works for the people and not the other way around." "When government thinks that it ultimately owns all income, bureaucrats never tire of finding ways to spend it." The op-ed is worth reading in its entirety. You may be able to use Google to find a copy, or there may be a copy at the Hoover Institution where Boskin is a senior fellow. Or visit your local government library. Kudos to Michael Boskin for an outstanding, informative, and helpful op-ed! Which Way Economic Freedom in the United States? "The world average score of 60.3—seven-tenths of a point above the 2013 average—is the highest average in the two-decade history of the Index, the editors note. Forty-three countries, including Singapore and Sweden, achieved their highest scores yet in the 2014 Index. Among the 178 countries ranked, scores improved for 114 countries and declined for 59. Four recorded no score change. "But the news was not all positive. The United States fell out of the top 10, its score declining enough to leave it in the 12th slot overall. The 2014 Index finds notable declines for the U.S. in fiscal freedom, business freedom and property rights, placing it again behind its neighbor to the north, Canada." Q.1. What is economic freedom? Q.2. What are the benefits of economic freedom? "The United States, with an economic freedom score of 75.5, is the 12th freest economy in the 2014 Index. Its score is half a point lower than last year, primarily due to deteriorations in property rights, fiscal freedom, and business freedom. The U.S. is ranked 2nd out of three countries in the North America region, and although its score remains well above the world and regional averages, it is no longer one of the top 10 freest economies. "Substantial expansion in the size and scope of government, including through new and costly regulations in areas like finance and health care, has contributed significantly to the erosion of U.S. economic freedom. The growth of government has been accompanied by increasing cronyism that has undermined the rule of law and perceptions of fairness." "Heritage found that countries that enjoyed more economic freedom had higher standards of living and less extreme poverty than those that had low economic freedom." "Taking our country back means regaining our freedom. Taking our country back means getting control of government and shrinking it and getting it more and more out of our lives. Taking our country back means returning to the principles and the traditions of the founding." " . . . History and common sense show that there is nothing to be gained from tearing down the wealthy. To the contrary, societies have always lifted themselves into prosperity, not by attacking the wealthy, but by creating a better environment for the wealthy to invest in new enterprises. "We should put the issue (of income inequality), not in the language of envy and guilt, but in the language of freedom, opportunity, and personal responsibility. This is about knocking down artificial barriers created by government, making it easier for the poor to lift themselves up through their own effort. Which also turns out to be a widely popular political theme everywhere, cutting across economic lines. "The (political) party that can convincingly take up that theme and connect it to specific reforms will not only win elections. It will do a vast service in uniting the country culturally and politically by defusing class warfare. And not least of all, it will improve the opportunities and future prospects for all Americans." Source: His April 21, 2014 essay, "Why Democrats are the Party of Inequality," posted at TheFederalist.com. With the term of Governor Terry McAuliffe at the midway point of its first year, it seems appropriate to note it's overall business tax climate ranking of 26th on the Tax Foundation's 2014 edition of the State Business Tax Climate Index (Fiscal Fact No. 420; March 18, 2014). According to the Tax Foundation, the index "enables business leaders, government policymakers, and taxpayers to gauge how their states’ tax systems compare." "While taxes are a fact of life, not all tax systems are created equal. One measure, total taxes paid, is relevant but other elements of a state tax system can also enhance or harm the competitiveness of a state’s business environment. This reduces many complex considerations to an easy-to-use ranking. (Our report looks at tax burdens in states.)" They also listed the 10 best and 10 worst. The best included Wyoming, South Dakota, and Nevada, but none of Virginia's neighbors. On the other hand, two of Virginia's neighbors -- Mayland (#41 overall) and North Carolina (# 44) -- were listed among the 10 states with the worst business tax climates. "The states in the bottom 10 suffer from the same afflictions: complex, non-neutral taxes with comparatively high rates. "While not reflected in this year’s edition, a great testament to the Index’s value is its use as a success metric for comprehensive reforms passed this year in North Carolina. While the state remains ranked 44th for this edition, it will move to as high as 17th as these reforms take effect in coming years. "Minnesota, by contrast, enacted a package of tax changes that reduce the state’s competitiveness, including a retroactive hike in the individual income tax rate. Since last year, they have dropped from 45th to 47th place. New York and New Jersey are in a virtual tie for last place, and any change next year could change their positions. Other major changes are noted in the blue boxes throughout this report." Virginia moved up one spot from the 2013 index, from 27th overall to 26th overall. Sleight improvements came from its individual income tax ranking (#38), unemployment insurance tax (#38), and property tax ranking (#27). Kudos to Scott Drenkard and Joseph Henchman who performed this Tax Foundation study. And we thank the Tax Foundation for publishing the study. From time to time, we've growled about the United Nations, including December 11, 2013, February 3, 2012, December 2, 2011, August 14, 2010, July 6, 2007, and July 4, 2006 -- generally because of some global taxation scheme or the overcompensation of their employees. Now, a U.S. General Accountability Office (GAO) report says, even "(t)he UN General Assembly has expressed concerns about the relatively large and growing portion of the UN budget spent on total compensation. The United States contributes 22 percent of the UN's regular budget." "The GAO tried to figure out exactly what’s going on with UN salaries and perquisites. The signal finding is that the UN itself may not be sure, and apparently is less than committed to finding out. The GAO, in its “highlight” summary  of the study, reports that “the UN has begun to address concerns about the sustainability of its rising total compensation costs, including initiating a review of total compensation” — but it seems that the compensation under study is actually well short of the real total. Or, as the GAO summary puts it, the UN “total” review “does not include key elements” (such as the almost $4 billion unfunded liability of the UN’s health insurance plan for retirees). "But how can such things be matters of mystery? After all, we know that the U.S. funds 22% of the UN’s regular budget. Surely with a bit of basic arithmetic the figures will fall into place? "Not a chance . . . ."
"For that matter, where is all that money coming from? The biggest contributor to this entire UN system is clearly the U.S., which tends to contribute 22% or more not only to the regular UN budget, but to most UN operations. But exactly how much, altogether, does the U.S. chip in these days? "It’s a mystery. Following a rash of UN scandals some years ago, such as Oil-for-Food and an extravaganza of graft in UN peacekeeping procurement, the U.S. Congress began requiring from the president’s Office of Management and Budget an annual accounting of all U.S. contributions to the UN — summed across all U.S. government departments and agencies. But, as Russell notes in his article on the mysteries of UN pay and perks, the U.S. government has stopped releasing these figures. The congressional requirement for this information expired in 2011, when the last of these OMB reports  tallied U.S. total contributions to the UN as $7.69 billion for Fiscal Year 2010. For the past three years, there have been no more OMB reports on this matter." "UN total compensation consists of salary, benefits, and allowances. Since its inception in 1945, the UN has based salaries for its professional employees on salaries for the U.S. civil service. In 2013, GAO reported that the UN sets its salaries between 110 to 120 percent of U.S. civil service salaries, and that UN salaries were 116.9 percent of U.S. civil service salaries in 2012. UN salaries increased to 119.6 percent in 2013." "It all sounds like a recipe for spending even more money to review the mystery of how the money is being spent — the real problem being that neither the UN nor the Obama administration seems terribly interested in solving either the riddle of U.S. funding or the enigma of UN spending. All we really know for sure is — yes — those are your tax dollars at work." Yesterday, after learning the Commonwealth of Virginia's Transportation Secretary Aubrey Layne had "notified Arlington and Fairfax County officials that the Commonwealth will increase its funding for the Columbia Pike streetcar by up to $65 million," we growled the latest vanity project of three of the five members of the Arlington County Board, i.e., the Columbia Pike streetcar project, was being constructed on fiscal sand. We cited a post at ARLnow.com, which was based on an Arlington County press release. The news item was quite definitive both in the title and the lede paragraph that the Commonwealth would be dumping those funds into county coffers although the press release used "up to $65 million" in the title. In an update this morning, we also noted the Washington Post story reported the story with the "up to $65 million" subtlety. "Clearly, the McAuliffe administration wants to support the project, but the state government, having given up control of the Columbia Pike right-of-way through Arlington to the local government some years ago, will not have the final say. "As the Sun Gazette long has reported but some others seem not to grasp, Arlington and Fairfax officials are now engaged in a game of "beat-the-clock" (thanks, Wayne Kubicki, for that apt analogy). They need to get a construction contract signed, sealed and delivered before Jan. 1, 2016, when it's possible - don't know if it's likely, but it's possible - that the anti-streetcar side could take control of the Arlington County Board and, in its first action, scrap the project. "The Arlington government is being somewhat, and probably purposely, nebulous about timing, financing and more. Trying to pin down the facts has not been easy. "Bottom line: Friday's action moves the streetcar project one step closer to reality. But unless a construction contract can be approved before the 2015 election season is wrapped up, there's no guarantee the streetcar is going to be built." Some Arlington County taxpayers may recall the dust-up nine years ago over the County Board's efforts to steal property rights (see our Arlington Homeowners Alert, November 13, 2005, or use the search function and search for "lot coverage" to identify other growls posts). The time seems right for Arlington taxpayers to contact the Arlington County Board to demand the County Board obtain the consent of Arlington County taxpayers before proceeding further on this major project. We urge all Arlington County taxpayers to contact the three Board members -- Jay Fisette, Mary Hynes, and Walter Tejada -- who refuse to ask Arlington County taxpayers for permission to fund and construct the Columbia Pike streetcar. And tell the Arlington County Board that ACTA sent you! Constructing the Columbia Pike Streetcar on Fiscal Sand? In their June 27 newsletter, Update, the Virginia Municipal League (VML), one of the two big lobbying outfits for Arlington County in Richmond, told Virginia's local governments that state "general fund revenue collections portend tough times ahead," and especially noted that "general fund revenue collections fell an eye-popping 20.7 percent in May." Two weeks later, the VML newsletter told Virginia's local governments the federal "transportation spigot (was) running dry," and emphasized the Commonwealth Transportation Board, which had just recently approved a six-year, $32.5 billion transportation plan, "recognizes that future reliability of federal funding is a major concern." Then yesterday, "Virginia Governor Terry McAuliffe announced (yesterday) that preliminary figures indicate the state concluded Fiscal Year (FY) 2014 with an approximately $438.5 million shortfall in general fund revenue collections, excluding transfers," adding that "revenue collections declined by 1.6 percent in FY 2014, behind the revised revenue forecast of 1.0 percent growth. This marks the first time that Virginia revenues have declined outside of a national recession." "The Commonwealth of Virginia is increasing its funding of the Columbia Pike streetcar system by $65 million, Arlington County announced today. "The county says the new funding will enable to Arlington and Fairfax to proceed with the streetcar project more rapidly — accelerating the construction timetable by at least a year — partially thanks to eliminating the need to obtain federal funding. “The Commonwealth is committed to supporting the Columbia Pike project as a funding partner,” Virginia Transportation Secretary Aubrey Layne said, in a letter to Arlington County Board Chair Jay Fisette and Fairfax County Board of Supervisors Chair Sharon Bulova. "The new funding will also help save $25 million in project costs, according to an Arlington County press release. The Columbia Pike streetcar is now estimated to cost $333 million, about half of which will be funded by the state. The other half of the cost will come from regional transportation funds and local commercial property taxes dedicated to transportation projects. “No Arlington County homeowner-funded General Obligation bonds will be used to finance design and construction of the streetcar,” the county said." The two County Board members who oppose the streetcar project -- Libby Garvey and John Vihstadt -- issued their own statements. Their responses emphasized that scarce resources should be used on projects where there is a broad consensus. In their press release, Arlington County's poobahs argue the $65 million in state money 1) enables the county to advance project schedules "at least a year;" and, 2) the "high-capacity streetcar will enhance northern Virginia’s economic competitiveness, generate new revenues for localities, Commonwealth." So now we have Governor McAuliffe and his merry band of bureaucrats enabling the crown jewel of the Arlington County Board's vanity projects. If you oppose the Columbia Pike streetcar, use the link in the right-hand column to send your own message to the Arlington County Board. Tell them ACTA sent you! The website of Arlingtonians for Sensible Transit (AST) contains the information you may need to construct your argument(s) to the three Arlington County Board members who continue to believe in the vanity boondoggle. "Virginia will increase state funding for the controversial Columbia Pike streetcar project by up to $65 million, the state transportation chief told officials in Arlington and Fairfax counties this week, allowing the streetcar line to be built at least a year faster and without federal funds. "He warned that the details and timing of the additional funding still need to be finalized but described the letter sent to county officials Thursday as “us saying we want to work with you.”"
"For most of our history, Congress did a far better job of limiting its activities to what was both moral and constitutional. As a result, federal spending was only 3 to 5 percent of the gross domestic product from our founding until the 1920s, in contrast with today's 25 percent. Close to three-quarters of today's federal spending can be described as Congress taking the earnings of one American to give to another through thousands of handout programs, such as farm subsidies, business bailouts and welfare. "During earlier times, such spending was deemed unconstitutional and immoral. James Madison, the acknowledged father of our Constitution, said, "Charity is no part of the legislative duty of the government." In 1794, when Congress appropriated $15,000 to assist some French refugees, Madison stood on the floor of the House of Representatives to object, saying, "I cannot undertake to lay my finger on that article of the Constitution which granted a right to Congress of expending, on objects of benevolence, the money of their constituents." Today's Americans would crucify a politician expressing similar statements." "The bottom line is that spending is not our basic problem. We've become an immoral people demanding that Congress forcibly use one American to serve the purposes of another. Deficits and runaway national debt are merely symptoms of that larger problem." HT Dan Mitchell's July 10, 2014 Townhall.com column. He says, however, he "would argue that a bloated government is the symptom of growing immorality. Deficits and debt are then symptoms of that problem." According to Public Law 107-300, improper payments should not have been made, or were made in an incorrect amount. They include payments to ineligible recipients, or for ineligible services, duplicate payments, payments for services not received, or payments that do not account for applicable discounts.
" . . . Federal agencies reported making $100 billion in payments last year to people who may not have been entitled to receive them. "Congressional investigators say the figure could be even higher. "In 2013, federal agencies made $97 billion in overpayments, according to agency estimates. Underpayments totaled $9 billion. That adds up to $106 billion in improper payments, or 3.5 percent of all the payments made by the federal government." "The largest sources of improper payments are government health care programs, according to agency estimates. Medicare's various health insurance programs for older Americans accounted for $50 billion in improper payments in the 2013 budget year, far exceeding any other program. "Most of the payments were deemed improper because they were issued without proper documentation, said Shantanu Agrawal, a deputy administrator for the Centers for Medicare & Medicaid Services. In some cases, the paperwork didn't verify that services were medically necessary. "Payments deemed `improper' under these circumstances tend to be the result of documentation and coding errors made by the provider as opposed to payments made for inappropriate claims," Agrawal told the subcommittee." "A trillion dollars over ten years is what Obamacare was supposed to cost (it's twice that now), so in essence, we throw away one Obamacare program every decade. "I think I'm going to be sick. "Incompetence, laziness, ignorance - the reasons don't matter as much as the bureaucratic culture that supports an attitude that finds this acceptable. Or, at least, a cost of doing business.Until there is a change in the bureaucracies in Washington that treats taxpayer money as if it were their own, we'll continue to hold $100 billion bonfires on the Mall every year." "The Welfare Indicators Act of 1994 of 1994 requires the Department of Health and Human Services to prepare annual reports to Congress on indicators and predictor of welfare dependence. The thirteenth report on Welfare Indicators and Risk Factors provides indicators and risk factors through 2011 fir most indicator, reflecting changes that have taken place since the enactment of the Personal Responsibility and Work Opportunity Reconciliation Act (PRWORA) in August 1996. As directed by the Welfare Indicators Act, the report focuses on benefits under the Temporary Assistance for Needy Family (TANF) program, formerly the Aid to Families with Dependent Children (AFDC) program; the Supplemental Nutrition Assistance Program (SNAP, former Food Stamps); and Supplemental Security Income (SSI) program. Welfare dependence is the proportion of all individuals in families that receive more than half of their total family income in one year from TANF, SNAP and/or SSI. "By this measure, according to the report, 23.1 percent of Americans were recipients of welfare in 2011. Since 1993, the earliest year covered by the report, that is the highest percentage of Americans reported to be receiving welfare." "A startling 38 percent of all children 5 and under in the United States were welfare recipients in 2011, according to the report." "As of the fourth quarter of 2011 there were 108,592,000 people living in households in the United States that received benefits from one or more “means-tested” government programs, according to the Census Bureau’s estimate. Those 108,592,000 “means-tested” government benefit recipients, according to the bureau, equaled 35.4 percent of 306,804,000 people in the United States at that time." "In the period since 1993, the percentage of people living in families receiving “welfare” (TANF, SSI and/or SNAP) hit its lowest level in 2000, when it was 12.5 percent, according to the report. Between then and 2011, it climbed to its highest-yet-recorded rate of 23.1 percent." "Has America gone past the so-called 'tipping point?' Rather than the 'Hope 'n Change' of the past six years, American's need to hope and pray the country has the strength to accept personal responsibility for success and failure. Only in that way will America remain America for another 238 years." UPDATE (7/9/14): Townhall.com's Daniel Doherty covers much the same territory plowed by Terry Jeffrey and CNS News. "The recession can be blamed for a lot of the increase, but beyond that, we are expanding the definition of "poor" and "needy" to include individuals and families previously ineligible. Common sense tells you that such inducements do not foster independence. But many seem perfectly willing to give up that independence for security." "It’s another case of bureaucrats gone wild, DC mandarins lavishing money on their own offices, and spending more per square foot on renovations to existing, perfectly usable office space than it cost to build lavish buildings like Trump World Tower and the Bellagio Hotel and Casino from scratch. But hey, four story glass staircases and two story waterfalls and sunken gardens aren’t cheap. "The Consumer Financial Protection Bureau is one of the most powerful and least accountable agencies of the federal government. The intellectual spawn of Senator Elizabeth Warren created by the ill-considered Dodd-Frank law of 2010, when Democrats controlled Congress, the CFPB has broad powers to regulate the financial industry, and is completely unaccountable to Congress’s budgetary powers because its funding comes from the Federal Reserve, the good folks who print money. "As can be expected from such an agency, it is feathering its own nest lavishly. In this case, the nest is rented quarters in Washington, DC, that the agency is paying to renovate to its very high and politically correct standards. Mind you the quarters were perfectly fine for the use of the Office of Thrift Supervision, but when you are Lord of the Financial Markets, nothing but the very best will do." "The renovation project has been mired in controversy. For more than a year, members of the House Financial Services Committee have questioned CFPB officials about its rising cost, about why an agency that is renting a building is paying for renovations in the first place, and the extravagance of such features as a four-story glass staircase, two-story waterfall and sunken garden. "“When they passed the Dodd-Frank Act, Democrats in Congress and the White House made the CFPB unaccountable to taxpayers and to Congress. We’re seeing the results of this dangerous unaccountability today in a Washington bureaucracy that is running amok, spending as much as it wants on whatever it wants. It’s outrageous,” said Financial Services Committee Chairman Jeb Hensarling (R-TX)." And here's a surprise. Not! From the committee's summary Lifson quotes, "The CFPB “was unable to locate any documentation of the decision to fully renovate the building.” (page 6 of the report)"
But it gets worse. Lifson reports that "(w)hile the Inspector General reports the current estimated cost of CFPB’s building renovation is $215.8 million, the building was appraised in 2011 for just $153.7 million, according to an audit report released by the Treasury." “When they passed the Dodd-Frank Act, Democrats in Congress and the White House made the CFPB unaccountable to taxpayers and to Congress,” Hensarling said in a written comment. “We’re seeing the results of this dangerous unaccountability today in a Washington bureaucracy that is running amok, spending as much as it wants on whatever it wants. It’s outrageous,” he said." And this agency is supposed to provide oversight over Wall Street and protect consumers? Sheesh! As the 4th of July weekend began last Thursday, the Wall Street Journal reported that gas prices were "walloping wallets" as "fuel costs hit "a high not seen in years." Nicole Friedman reported, "As Americans drive to barbecues and the beach in coming days, they will be paying more for gas than on any Independence Day weekend since the record highs of 2008." "But average hourly earnings in June were up just 2% from a year earlier, the Labor Department said Thursday, basically keeping pace with rising prices as measured by the agency’s consumer-price index. "Wages are showing no acceleration: The average year-over-year wage gain since the beginning of 2010 has been precisely 2%. “Despite the rapid decline in the unemployment rate…we are still not seeing any significant pick-up in wage growth,” Capital Economics chief North American economist Paul Ashworth said in a note to clients." "In other shocking news: The federal government is impeding productivity. "The Bureau of Land Management is taking its time to approve oil and gas drilling permits on federal and Indian lands, according to new report from the Department of the Interior's inspector general. "Though federal law says the government must approve or disapprove these types of permits within 30 days, BLM takes an average of 228 days or longer to do so, according to the IG. "Not prioritizing faster processing of permits — known as applications for permits to drill, or APDs — is to blame, according to the IG. "While BLM told the IG it has a backlog of nearly 3,500 permit requests, it also said it has no immediate plans to process them. "Though it approves 99 percent of requests received, only six percent are approved within the 30-day requirement." So while the Obama administration continues its footdragging on the Keystone XL pipeline, which even the Washington Post editorialized against in April, Interior Department bureaucrats slow-walk drilling permits. "Believe it or not, a place exists where companies are hiring like crazy, and you can make $15 an hour serving tacos, $25 an hour waiting tables and $80,000 a year driving trucks. "You just have to move to North Dakota. Specifically, to one of the tiny towns surrounding the oil-rich Bakken formation, estimated to hold anywhere between 4 billion and 24 billion barrels of oil." The IG's "Onshore Oil and Gas Permitting" is available at the Examiner's website. The Washington Free Beacon also reported on the IG report. Independence in 1776. Dependence in 2014? "Obamacare has pushed us over the entitlements tipping point. In 2011 some 49.2 percent of U.S. households received benefits from one or more government programs—about 151 million out of an estimated 306.8 million Americans—according to U.S. Census Bureau data released last October. "Currently, around 6 million to 7 million Americans who have signed up for Obamacare are receiving taxpayer-provided subsidies (though the administration’s numbers cannot be trusted, it’s all we have to work with). There are another 3 million who have signed up for Medicaid. "That means some 10 million Americans—or a total of about 161 million—are now getting government subsidies (though the final number might be somewhat lower since some may have been receiving benefits already). "Thus, perhaps 52 percent of U.S. households—more than half—now receive benefits from the government, thanks to President Obama. And Mr. Entitlement is just getting started. If Obamacare is not repealed millions more will join the swelling rolls of those dependent on government handouts. But, Matthews writes, "Conservatives have long dreaded the day when the U.S. crossed the halfway mark because of all the implications for individual and fiscal responsibility. As Benjamin Franklin reportedly said, “When the people find that they can vote themselves money, that will herald the end of the republic.” They learned that from the 2008 election and turned out in big numbers again in 2012." Matthews' conclusion? "The country has crossed the entitlement tipping point. The only hope is to try to transition some of these programs, primarily Social Security but also Medicare, into personal retirement accounts. They would, over time, be better funded, actually belong to the worker or retiree, and, perhaps most importantly, they would take millions of Americans off the government benefits roll." "Since the 1960s, the Catalog of Federal Domestic Assistance (CFDA) has provided a list of all federal subsidy programs. That includes subsidies to individuals, businesses, nonprofit groups, and state and local governments. The CFDA includes subsidies for farmers, retirees, school lunches, rural utilities, the energy industry, rental housing, public broadcasting, job training, foreign aid, urban transit, and much more. "The chart below shows that the number of federal subsidy programs has almost doubled since 1990, reaching 2,282 today. The genesis of the CFDA was the explosion of hand-out programs under President Lyndon Johnson. Members of Congress needed a handy guide to inform their constituents about all the new freebies." "A recent poll found, unfortunately, “a significant transformation” among American adults over the past two decades. People used to be twice as likely to blame poverty on the poor, rather than on external forces, according to a Wall Street Journal/NBC News poll. "Today, however, more people – 46 percent – blame poverty on circumstances beyond the poor’s control than believe people don’t do enough to help themselves – 44 percent. "We used to acknowledge that personal responsibility determined success and failure. Today, we say it’s somebody else’s fault when we fall short. The buck stops there. "This is the inevitable result of the narcissism of wants and needs surpassing personal responsibility. It’s the immaturity of appetite without a grown-up appreciation for feeding it. It’s also the motivation for entitlement thinking. "Thank you, Franklin D. Roosevelt, inventor of “rights” that never before existed. In his 1944 State of the Union address, Roosevelt proffered a “Second Bill of Rights” to expand government to make life more secure." "The entitlement frame of mind was planted with well-intentioned seeds of compassion. We can’t let the poor starve. Those without must not suffer. "It’s easy today to myopically complain about welfare recipients and food stamp recipients living from one government handout to the next. But, as the Wall Street Journal/NBC poll shows, the entitlement mindset is now pervasive, seeping into Middle America as never before. "Don’t doubt today’s ingrained sense of entitlement. What American will voluntarily return his Social Security check, or turn down his Medicare coverage? To claim these are “earned” benefits is laughable if how they are financed is understood. The relationship between what recipients put in and get out is illusory. That’s why both entitlements, which span all income levels, soon will be bankrupt." Has America gone past the so-called 'tipping point?' Rather than the 'Hope 'n Change' of the past six years, American's need to hope and pray the country has the strength to accept personal responsibility for success and failure. Only in that way will America remain America for another 238 years. At American Thinker today, Elise Cooper uses her column to answer several questions about the 4th of July from the perspective of several best-selling authors. Her introduction? "The following best-selling authors write about American values and customs and/or have characters that attempt to keep U.S. citizens safe. American Thinker interviewed them about their patriotic spirit." Ted Bell, whose latest book is Warriors: If you did one of those man-in-the-street interviews and asked random passersby that question they’d probably say “Fireworks”! Very few people are taught history anymore. They have little clue about the epic struggle that lies behind that holiday, nor of the brilliance and bravery of that little band of brand new Americans who made it possible: creating the greatest system of government the world had ever seen. We need to restore the Founders to the classrooms before it’s too late, if it’s not already. Alafair Burke, whose latest book is All Day And A Night: Clearly there's an appreciation of country, but I also associate July 4th with both community and personal independence: good people standing up for what they believe in. J. A. Jance, whose latest book is Remains of Innocence: It's the birthday of our country, the land of opportunity. It's the place my forebears came to as immigrants, looking for a better life, and they found it. Oliver North, whose latest book is Counterfeit Lies: Independence Day is the culmination of what transpired in that long difficult year to dissolve the union between us and a tyrannical foreign leader, as well as how fifty-six remarkable men sat down and created something the world has never seen before. I hope these values will not be given away today. James Rollins, whose latest book is The Kill Switch: It’s a celebration of family and country. It’s a time to remember how blessed we are to live in this beautiful land: free and able to pursue our dreams. Beatriz Williams, whose latest book is The Secret Life Of Violet Grant: Now that I’m an adult, the holiday reminds me of our extraordinary nation, that such a brave and brilliant collection of men and women gave us our start. When I hear the words “our lives, our fortunes, and our sacred honor,” I just get chills. That oath had heartfelt meaning in the 18th century, and we should try to live every day in appreciation of the sacrifices these people willingly made for us, the generations who followed. Thomas Young, whose latest book is Sand And Fire: It's a celebration of the American experiment: government of the people, by the people, for the people. Ideally, it's a moment to take a break from political differences and share in the appreciation of American ideals. Read the authors' responses to the other two questions: 1) What do you love about America; and, 2) How do you define freedom? Their responses are equally enlightening. Seems the story of the June jobs report, which came out at 8:30 A.M. this morning from the Bureau of Labor Statistics, depends on who you are listening to. "The U.S. economy added 288,000 jobs in June, the Bureau of Labor Statistics reported Thursday. "That number beats economists' expectations and comes along with other good news: Job growth was revised higher for both May and April. "Taken altogether, that means employers added 1.4 million jobs in the first six months of the year. "That's the strongest six months for job growth since 2006. "Meanwhile, the unemployment rate is now 6.1%, down from 6.3% in May. The drop came for the right reasons: More Americans said they had jobs, plus more people joined the labor force." Meanwhile, at the business-oriented CNBC, the headline of Jeff Cox's story included: "Boom! Job growth accelerates." "In fact, part-time employment sounded the main sour note in the report. Part-time jobs accounted for all the net job growth in June. The household survey has two separate definitions of part-time jobs. One jumped by 1.1 million (+275,000 part time for economic reasons and +840,000 for non-economic reasons). The other surged by 799,000. Since the start of 2014 both these measures have trended up. And since the recession began the hours of workers in the bottom quintile have fallen and stayed low. "This could reflect the healthcare law encouraging employers to reduce workers to part-time status. Or it could reflect statistical noise—average hours did not change in the payroll survey and the household survey has a much larger margin of error. It will take more time and data to determine what caused this shift." "The number of Americans 16 and older who did not participate in the labor force climbed to a record high of 92,120,000 in June, according to data from the Bureau of Labor Statistics (BLS). "This means that there were 92,120,000 Americans 16 and older who not only did not have a job, but did not actively seek one in the last four weeks. "That is up 111,000 from the 92,009,000 Americans who were not participating in the labor force in April. "In June, according to BLS, the labor force participation rate for Americans was 62.8 percent, matching a 36-year low. The participation rate is the percentage of the population that either has a job or actively sought one in the last four weeks." Rush Limbaugh got down and deep into the BLS statistics on his radio show today, and his assessment was: "It's not good. It's horrible, in fact, and it's not representative of any kind of legitimate economic recovery." And he can support those descriptions. "June marked the best five-month stretch of job creation since early 2006. The data also sent a welcome signal of economic health after output shrunk in the first quarter at its fastest pace since the recession, an annualized 2.9% decline. "This is one welcome Fourth-of-July report for the outlook," said Chris Rupkey, chief financial economist at Bank of Tokyo-Mitsubishi UFJ. The 288,000 new jobs "are just the fireworks the economy needs to brighten up." "The labor force participation rate, however, was stagnant at 62.8% for the third month in a row. At 59% the employment-population ratio was little changed from the prior month. “Perhaps the only disappointment might be that average hourly earnings growth remains subdued,” wrote RBS’ Sharif. Hourly earnings gained just 0.2% in June, bringing the year-over-year rate to 2.0%. The workweek was steady at 34.5 hours. Here are the Bureau of Labor Statistics source material: 39-page BLS July 3, 2014 news release (USDL-14-1243) in .pdf format; employment situation archived news releases; and employment situation news releases -- summary and tables A-1 through B-9. "It took only 5-1/2 years, but we're finally getting some favorable jobs numbers out of the Obama administration. That's good news. But one robin on the lawn does not make it spring." "Wages are the big concern of workers now. They just aren't growing as fast as they should. "Wages and salaries were up 2% over the past 12 months, but that has been offset by surging gas and food prices. So the purchasing power of the middle class is shrinking. "Obama said last week that more unemployment benefits, more infrastructure spending and a rise in the minimum wage will solve the problems of too few jobs and stagnant pay. "In fact, that's just doubling down on five years of failed policies. It's time for Republicans to counter with a real economic growth agenda on energy, taxes, sound money, small-business promotion and budget restraint. "Half of Americans think we are still in a recession. "No matter how many times Obama tries to take a bow on the modestly improving economy, voters aren't buying it. Nor should they." So, the terrible news balances the good news? So Arlington County Doesn't Need a Strong Watchdog, Eh? "Arlington County is being accused of “cronyism” and “underhanded tactics” in its attempt to award a contract for garbage, recycling and yard waste collection. "The county has delayed its recently-approved year-round yard waste pickup program in light of the lawsuit. It canceled its one-year contract with American Disposal, but awarded the company an emergency services contract, for garbage and recycling pickup only, which took effect today. "Bates claims that its proposed contract was the best value and would have saved taxpayers money. "According to a Bates Trucking press release, the county’s now-canceled collection contract with American Disposal would have cost $15 million more over a period of 9 years than that offered by Bates, thanks in large part to Bates offering $9.45 million worth of free recycling processing." In the Growls on May 10, 2014, I asked who is looking out for Arlington County taxpayers, noting that earlier that week, the Arlington County Civic Federation had urged the "county government 'to do more to address internal auditing.'" While the county may be moving in the right direction to increase internal audit staffing, it is evident the majority of the members on the Arlington County Board are kicking and screaming while being dragged in the right direction. It seems that Arlington County voters will need to give those Board members an even swifter kick in order to put in place a strong, active, dynamic, and energetic internal audit function. The claim that cronyism was involved in awarding the waste contract only underscores that need. And, as we explicitly explained in that Growls, an internal audit staff of one or two auditors does not result in a strong, active, dynamic, and energetic function! Growls readers are urged to contact the Arlington County Board. Use the link in the right-hand column, and tell them ACTA sent you! "Applications for insurance coverage through President Obama's health care law submitted in the final three months of 2013 contained millions of inconsistencies in which information such as income and immigration status could not be independently verified by the federal government, according to a June report from the inspector general of the Department of Health and Human Services." The inconsistencies may have resulted in individuals receiving an improper amount of subsidies, or subsidies that they shouldn't have been eligible for in the first place — something that could require them to repay the money in future tax bills. "In other cases, inconsistencies led to bizarre outcomes. According to the report, "one marketplace cited situations in which infants and young children included on applications were erroneously identified as incarcerated." "At issue is the information that individuals are asked to submit when they apply for coverage, such as income, citizenship status, Social Security number, or incarceration status. In theory, once data are submitted, they are supposed to be checked in a massive storage database known as the "hub," which gathers data from multiple federal agencies. "According to the HHS inspector general, applications submitted to the federal exchange in the opening months of Obamacare -- October 2013 through December 2013 -- contained over 2.9 million inconsistencies, of which more than 2.6 million, or 89 percent, remained unresolved as of Feb. 23, 2014." 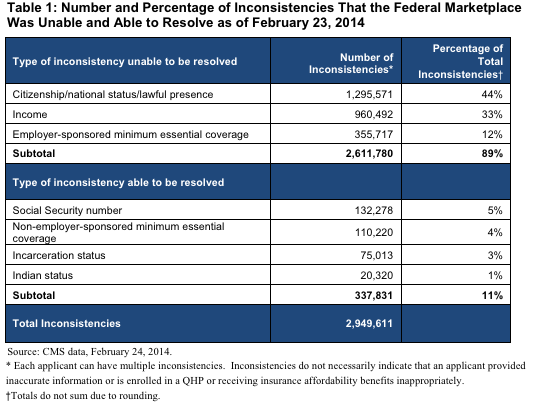 "To be clear, this does not mean that 2.9 million separate individual applications contained inconsistencies. Every applicant is prompted to answer a series of questions, and thus any given application can contain multiple inconsistencies. HHS could not provide data on the number of applications that included at least one, so there's no way of saying what percentage of the total number of applications were affected. An inconsistency also doesn't necessarily mean information is inaccurate, either, it just means it can't be matched with available data." "These deficiencies occurred because (1) the marketplaces did not have procedures or did not follow existing procedures to ensure that applicants were enrolled in QHPs according to Federal requirements or (2) the marketplaces' eligibility or enrollment systems had defects or lacked functionality. For example, the Federal marketplace's system functionality to resolve inconsistencies in eligibility data had not been fully developed. In addition, we noted other issues that may be of interest to stakeholders." "The inspector general's inquiry was requested by congressional Republicans as a condition of ending the budget standoff that partially shut down the government last fall. Republicans say they are concerned that people who are not legally entitled to the law's government-subsidized health insurance could nonetheless be getting it." Breitbart's Wynton Hall provides an update version of their earlier report. "Looking at just 45 randomly selected applications, the analysis found cases where income data were wrong, Social Security numbers hadn't been checked, citizenship or legal status hadn't been verified and information was entered incorrectly. "The IG said that, as a result, the exchanges had limited ability "to prevent the use of inaccurate or fraudulent information." "Oh, and the government apparently hasn't been properly reconciling its enrollment numbers with insurance companies to account for dropouts and cancellations — casting more doubt on enrollment numbers. "If ObamaCare were a private company, you can bet its executives would be facing criminal charges. Instead, Obama and the press are cheering ObamaCare as a great success." "You'd think that a government audit showing how ObamaCare couldn't tell whether millions of enrollees were eligible for the subsidies they're getting would be front-page news. Instead, the press hid it from view. "If you wanted to read in the New York Times about these findings — which detailed rampant problems verifying eligibility and income information from millions of ObamaCare applicants — you had to dig 17 pages into the news section. "In the Washington Post, the story was on page 11, after stop-the-press-stories like a change in House travel reporting rules and a puff piece on the new VA administrator. If you relied on the network news, you'd be completely in the dark. "For anyone who's covering ObamaCare fairly, you couldn't miss the significance of the findings made in two separate HHS inspector general reports. "Basically, the reports revealed widespread and systemic failure to prevent costly mistakes, like enrolling people who aren't citizens, or paying too much in subsidies." This should have been page 1 news in every newspaper across the nation. Is there any wonder there is so much conservative loathing of the MSM.